Order in 2 Hours 40 minutes 44 seconds for dispatch today! 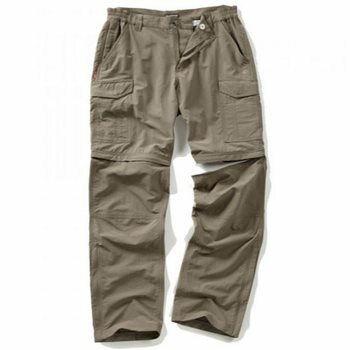 Check out these classic Craghoppers hot-climate travel trousers and you’ll enjoy lightweight, comfortable and versatile performance on the tropical trail. The zip-on, zip-off convertibles have a streamlined design that incorporates permanent sun-protection and NosiLife insect-repellent for round-the-clock coverage. There are 9 useful pockets, including 2 zipped pockets, Drybag and mobile phone pocket, part-elasticated waist, drying loops and heel tape. Convertible trousers that have become a Craghoppers travel standard. Many Craghopper garments use fabrics and finishes that give total 'easy care' attributes, such as fast drying and minimum ironing. All of our shirts, even 100% cotton, are designed to need minimum to no ironing. This is achieved either through the use of crinkle weave constructions or by the addition of a finish that encourages creases to simply drop out. Get out there and enjoy the sun without taking risks. Our SolarShield fabric technology has been tried and tested to give you UPF40+ protection from harmful UV rays. SolarShield is Craghoppers' range of permanent sun-protective fabric tested for UV-protection UPF40+. Sun-protection is given by a combination of 3 things, the density of the fabric construction, the type of yarns used and its colour. Super-effective, discreet storage pockets to help keep your valuables safe. THE WORLD'S FIRST AND ONLY PERMANENT INSECT-REPELLANT CLOTHING RANGE. Our insect-repellent treatment is permanently woven into the fabric; protecting against biting insects. NosiLife is a breakthrough in textile innovation, utilising a new and unique permanent anti-insect technology. Tested by an independent testing laboratory, to provide proven protection for the lifetime of your garment. Proven up to 90% protection from mosquitoes and other biting insects that can cause life threatening diseases such as Malaria. Secure zipped closures for added peace of mind when you're on the move. MOVES BODY MOISTURE AWAY FROM THE SKIN. Keeping you cool on the move and fresh in the most intense humidity. These fabrics are engineered for the ability to effectively move moisture away from the skin and to rapidly evaporate it over a large surface area.